The budget planner template to be reviewed is geared more towards a wedding, which we all know can run rather expensive depending on what all is required for it. At the top will be a section for total expenses, with the ability to list how much you are expected to spend versus how much you actually spend. Underneath this are sections involving items such as apparel, decorations, flowers, and other gifts. These sections are treated the same as the “total expenses” section at the top of the form, as you will need to plug in how much you spend on certain items versus how much you expected to spend on them. 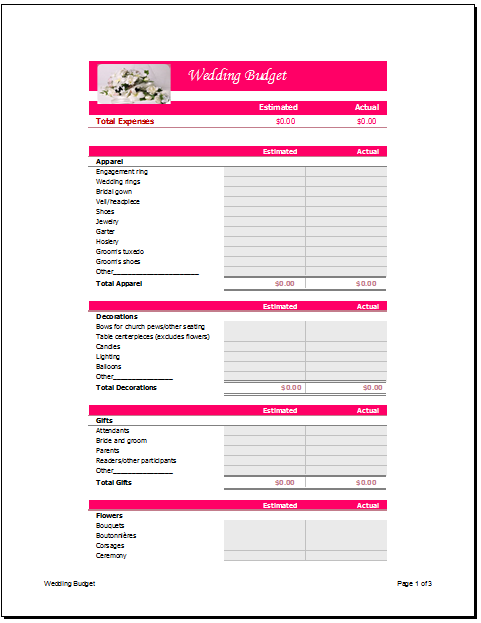 All in all, if either you or someone you know is planning a wedding, this is a template that will most definitely be a great tool to utilize, especially if you are planning on working with a certain budget.